We headed back to Grant Inn (not it's name anymore - but that's what it will always be to me - LOL!) to get some Nacozari turquoise from Stephen Mauldin. He had some gorgeous stuff and some finely made. Aren't these faceted beads gorgeous and the heishi is so regularly cut! 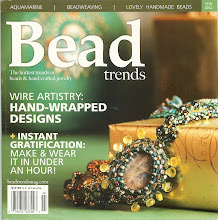 I also met my lampworking friend Lea Avroch - but totally forgot to take a picture. Was so glad we could meet up before she and her hubby left! Once we made it to Lucky Gems my mom and I sorted through many pearls to find nice strands of large rounds ones for my pearl snowmen and some "blobs" for a friend in Australia. Not sure what they're really called but I call them blobs - LOL! Then it was lunch time! We went to the Ajo Cafe were the have pretty good pies and make a decent BLT. Not quite as interesting as the Sunny Daze Cafe - but still good food and close to the Holidome/Gem Mall venues. After lunch we went back to Holidome and I found another of the Best in Gems booth and HAD to look through their earring drops too :) They have some gorgeous stones! And this time I met the REAL Ajay - LOL! And he's pictured with Jaya. Mom looking through the gorgeous earring pairs! We wandered up/down all the aisles at Holidome then popped over to Gem Mall to check out a few of my favorite vendors. I did get more sterling beads and looked for some unusual cuts at some of my other favorite vendors but didn't find anything that wanted to jump into my bag. We'll "do" Gem Mall in more detail later this week since I often find new favorite vendors as I wander the aisles. And now - day 5! We went to opening day for GJX and AGTA. I dreaded it since the last time I did that it was wall to wall people and you could barely walk! Well that was not the case today - far from it. Not good for the sellers and it doesn't say much for the current world economy. We wandered up/down the aisles of both AGTA and GJX and I only got a few things - one from a new vendor and one from an old favorite. I wish I took more pictures so you could see the plates of diamonds, emeralds, sapphires, ... AND the diamond jewelry in booth after booth after booth. These are high end shows and you just can't imagine the stunning gems and jewels that surround you at these shows. In fact we passed some booths that were empty, but when we came back down the next aisle we saw Loomis Armored car guards wheeling down box after box of pretties. You know it's worth a bit if Loomis is the delivery company! After we went up/down the aisles of GJX we walked across the street to AGTA. I visited Taj again and found a nice strand of the black labradorite - yum! . I also got more of those cute little multi-gem 4mm rounds and some nice tourmaline carved leaves. Oh - and my mom got some of this brass chain with blue imitation lapis on it. And that's it for Tuesday! We had dinner with a friend and now it's time to say good night. Happy, sparkly, gemmy dreams to all of you! It's the Tucson time of year! But did I remember to take a picture with Toyo? No! I will next time. We weren't too hungry after a late lunch so we just got some soup and bread at the store and had that for dinner. I'll be going back to buy some on Monday since I was just looking around that day. Then we had lunch at BJ's brewery and went to the Howard Johnson GIGM show. Unfortunately my favorite turquoise guys, Nevada Turquoise Co., didn't show :( I was sad. I did get some pictures of some cool amethyst monster geodes from Brazil. This is the same geode with my mom in the picture for size reference. Next we went back to JGM. I spent all my time at Best in Gems this time. I was looking for cabs for a friend and my mom noticed these beautiful earring pairs! So of course I had to go digging in the piles! And here are Bik and Tarun at Best In Gems who stayed passed closing time so we could find our pretties! And a shot of ALL those beautiful stones! And, finally, today! We hit Holidome today. They opened yesterday so we stayed away since it is usually a mad house on opening day. I wanted to make sure I checked out the offerings at Taj since they often have some unusual stones. I'm still searching for one particular stone so I may have to go to their booth in GJX on opening day ... ugh! Here are the pretties I got at Taj. I love the carved, triangular tourmaline. Next we went to Ivory Jacks and I got some cool moose antler figure 8 dangles. These cost a bit less than ivory but still look pretty cool! Next up was lunch! We hoped to go to the Ajo Cafe - but, alas, they are closed on Sunday. So we did what phone wielding person would do - called up Google maps and searched for restaurants near us. We found one with good reviews and headed to the Sunny Daze Cafe. I have to agree with the reviews - the food was excellent, the service was wonderful and the restaurant decor is a kick! Here is a picture of our waitress (darn I'm bad with names!) in front of just a few of the pink flamingos that inhabit the restaurant and the outside of the restaurant. Then it was back to Holidome :) This time we went to see what pretties we could find at Intrinsic Trading. Of course I found some cool things - but the best of all were some earring drops in Mexican Purple Opal!! Woohoo! I got some rough for this 2 years ago and have been waiting to see someone make something with it. Thank goodness my mom saw it since I was checking out when she found it. I did a quick visit with Lucky Gems to check on some pearls but didn't quite have the information to buy so we just started going up/down the rows at Holidome. I'm noticing more and more jewelry sellers at all the venues which is unfortunate since that means fewer gem dealers are around. Nevertheless I perused many of the gemstone vendors and found one, Earthstone, with these incredible, thin, curved abalone drops. They are just so ephemeral! The gal helping me went on a hunt for unusual cuts - unfortunately the ones she and I found were either WAY out of my price range or in stones that just don't do it for me. They had this incredible thin, curved, flower petal shape - but it was in prehnite (too pale), mookite (too much orange and orangey yellow) and some black/white/orange stone - not my kind of colors but the cut was just amazing! I did get some pretty, melon cut fluorite! And the day at Holidome concluded with another beautiful sunset - showing the snow on the mountains!